I was just wondering if this will work with any mods that alter the ending of the game a bit? Mainly, because I downloaded the Citadel Epilogue mod, and LIME Less Is More Endings and I'm just checking to make sure that your mod won't have a problem. The mod works with CEM perfectly, but it is NOT compatible with LIME - which if you check, actually removes TIM and Anderson from the Citadel. So I can't convince/provoke the Illusive Man if I use this mod? A lot of people are saying the game crashes if you do. Is there any way to let the paragon/renegade scene with TIM play out but not have the game crash? Asking because while I love Anderson, The Illusive Man is also one of my favourite characters (I know, unpopular opinion) and I feel that final talk with him really caps off his character arc in a nice way. So I'd love it if I could see both my favs get a conclusive ending rather than having to pick between which one to give a better closure. The issue is caused by a lot corrupting the file BioD_End002_500Choice.pcc, you can replace this file with the original included in the mod that has the issue and it'll work no problem. It shouldn't be this mod causing it though, since it doesn't include this file, in my case it was caused by THANEMod but perhaps another file was corrupted for people saying removing this mod fixed it for them, I'm not really sure. Check the ME3Log.txt file in the folder where MassEffect3.exe is located (requires the ASI logger mod) for details, but it's easily fixed so it shouldn't keep you from using this mod. Thank you! I was having this problem with a lot, MEHEM & this Mod and grabbing the BioD_End002_500Choice.pcc file from the DLC_CON_END folder and copying it into the main cookedpcconsole as well as the one in the MEHEM DLC folder fixed this. Thanks for pointing me in the right direction. EDIT: This mod will be overriden by Carnifex4Predator DLC MOD, so be advised if you use both of these mods. Is this mod compatible with EGM and BackOff? 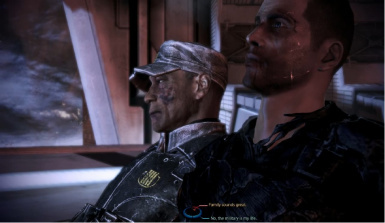 I had EGM, BackOff, and Extended Final Anderson Conversation installed during my latest playthrough of Mass Effect 3, and I had no issues. If you do have issues, though, you could always disable BackOff (as well as BOPatches) by renaming the folder "DLC_CON_BACKOFF" to "off_DLC_CON_BACKOFF" ("off_DLC_CON_BOPATCHES" for BOPatches), without the quotations, of course. I believe adding "off_" to the beginning of EGM's folder would work, too, if necessary. With this mod installed my game crashes right after illusive man shoots himself, or you shoot him, i've uninstalled, even reinstalled the entire game, I have a feeling I'm missing a file somewhere to delete to make this work, shame it crashes my game, possibly broke it. EDIT: Nevermind I found the issues, it would seem that you can't pick the final Paragon or Renegade options during the last conversation with the illusive man, I picked a normal response and the game flowed as normal. Thanks for this, since this mod doesn't appear to be maintained anymore, at least we have a work around! Are you using other mods? If so which of them? Do you still need to load the file into ME3 Explorer and run it when downloading and running v2.0? I played the whole game while looking forward to getting to Anderson's extended conversation and when I finally did it, the game crashed on me just after TIM killed himself. I tried uninstalling, like someone else said, but it still won't work, even after restarting Citadel:The Return. I'm using a bunch of other mods, EGM, a lot, Citadel Epilogue (Lite), MEHEM and BackOff. Anyone know what I should do? I spent 49 hours on this Shep and I really don't want to have to give up while I'm basically on the finish line. Does this mod already come with me3recalibrated? I've got a little issue. I can't manage to get the additional dialogue. I used to use the previous version which overwrites, and it worked back then. Is the mod supposed to work on localized versions as well ? EDIT : made some tests and it works only with english on.